I’ll get to the food and adventures later. 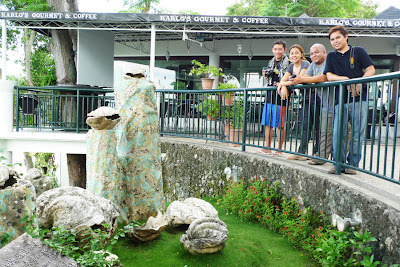 For now let’s look at some of the spots we visited around Davao City. 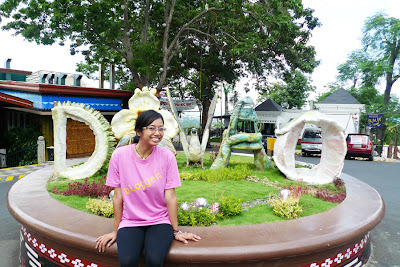 See, I’d never been to Davao—or anywhere in Mindanao, actually—so I was feeling all giddy all week before the trip. From what I’d seen in pictures, and from what my family and friends had told me, Mindanao is a beautiful place. And you know what? They were right. My trusty mp3 player served me “Romantic Flight” from How to Train Your Dragon as we flew over the island. I had to breathe a happy sigh. Perfection, I tell you. Perfection. 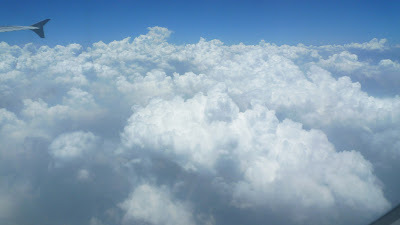 The sky was blue, the clouds were fluffy white—FLUFFY!! !—and I was sure it was going to be a beautiful weekend. My plane hadn’t even landed, and I was already in love with Mindanao! Upon touchdown, Tita Dess picked me up from the airport because I was staying at their house. 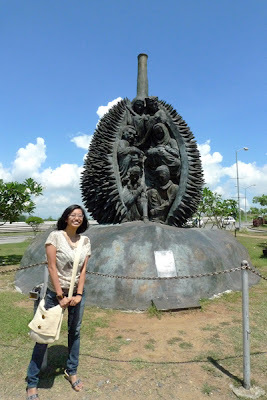 Before leaving the airport, though, taking a photo with the giant durian is a must! I love, love, LOVED Davao weather. It was sunny but windy and cool, much like how the weather usually is in Decembers, which, incidentally, is the month of my favorite weather. I saw the cityscape in bask in this beautiful weather on my second day there. Lyle, Melo, Donna, Jonel and I went to Jack’s Ridge. It’s something like a restaurant plaza now, but before it was an important Japanese outpost, seeing as it has a clear, commanding view of the Davao gulf. The marker explains the historical significance of Jack’s Ridge. But, apparently, it also has prehistoric significance. Aside from the bullets and World War II items the locals occassionally find, giant taklobo shells have also been found on this mountain ridge! These huge shells were found on top of the mountain! 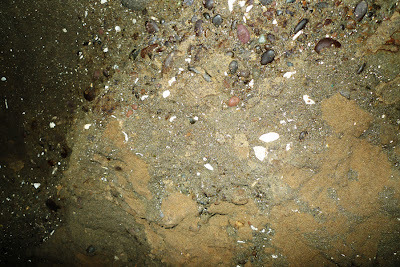 Shells that huge can only be seen deep underwater, so it’s evidence that Davao was once under the sea millions of years ago. Awesome! Speaking of shells in the mountain, we saw some on the ceiling of a Japanese tunnel. They don’t look like much in photos, but it’s pretty freaky cool in real life! There are several tunnels around the mountains that were used by the Japanese during World War II, but there was one discovered by someone trying to build a hotel. 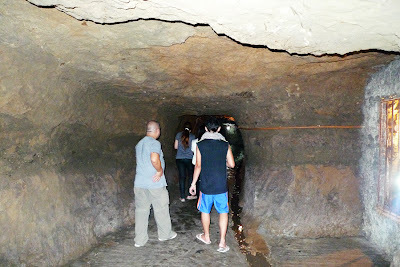 They were just excavating the land when they uncovered damp passageways and rooms that were the Japanese soldiers’ hiding place during the war. They decided, then, to name the place D’ Japanese Tunnel. 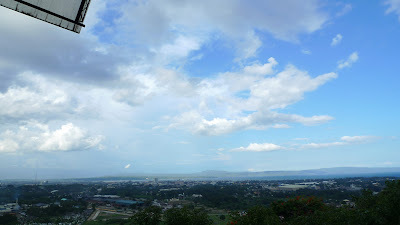 Now a hotel, restaurant, and tourist attraction along the Diversion Road, Maa, Davao City. After sightseeing and crouching in tunnels, we decided to go on ahead to Envy Me Salon for some rest and relaxation. Haha! Not a sight-seeing place, I know, but we all need to loosen up after frolicking around the city, yes? I had a glorious massage there, I tell you! It’s a great way to end your trip, or get a little breather in the middle. Thank you so much, Donna, for taking me there! Also check out Envy Me Salon and Spa’s blog! Speaking of breathers, I think I’ll take one right here. There’s so much more to write about! Davao’s tourism tagline is “From Islands to Highlands“. I’ll get to writing about the islands, more highlands, and the FOOD! Ah, the food! More about Davao in a bit! Davao! I agree about the weather. I went there last year to visit family, and I totally loved the weather. I almost didn’t want to go back to Luzon, much to the delight of my cousins who have been trying to convince me to relocate there permanently.